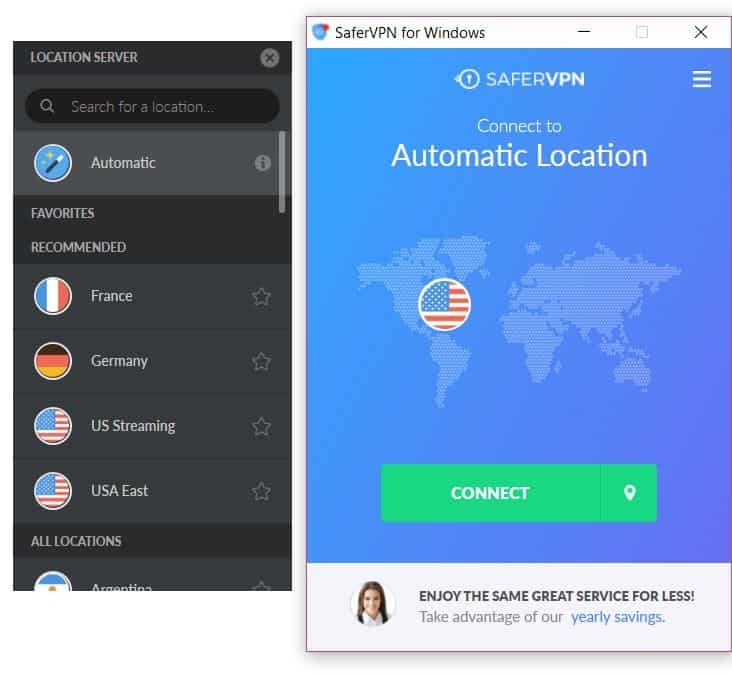 You are here because you want to know how well this application works today in 2019, and that’s exactly what I am about to share in this in-depth SaferVPN review. I’ll be breaking their service down in great detail, discussing the speed, customer support, security, and features of SaferVPN along with a bit of background about the company and their operations. I’ll also cover Torrenting & Netflix. While using SaferVPN, I managed to achieve an impressive 79.23 Mbps on an EU server, making SaferVPN the 5th fastest VPN (out of 70+) that has ever been reviewed on this site. Here’s a speed test I ran on speedtest.net to ensure the accuracy of this review. After all, with download speeds this fast, there’s no way that SaferVPN could offer their services at a budget-friendly price, right? Call me petty, but I absolutely detest VPN providers who force users to restart their devices after installing the VPN client. Luckily, not only is SaferVPN “Restart Free”, they are also one of the simplest and most user-friendly VPNs that I have ever reviewed. About 3 minutes after I purchased their services, SaferVPN was installed, launched, and protecting my Windows device. With one of the most straightforward user interfaces I have ever encountered, SaferVPN makes it easy to use their service and you can protect your device with just the click of a button. They also make it easy to quickly find and optimize your settings and ensure that you have the perfect connection for your specific goals. Although SaferVPN might not be the most feature-rich provider that I’ve ever reviewed, their intuitive design and easy to navigate interface makes using their software an absolute delight. While it isn’t up to the standard of a company like ExpressVPN, SaferVPN’s customer support definitely exceeded my expectations. Throughout the course of this review, I submitted a handful of queries at different times, some of them genuine, and some of them designed to gauge the efficacy of the support team. Each time, I received a prompt response to my question and was on my way in a matter of minutes. 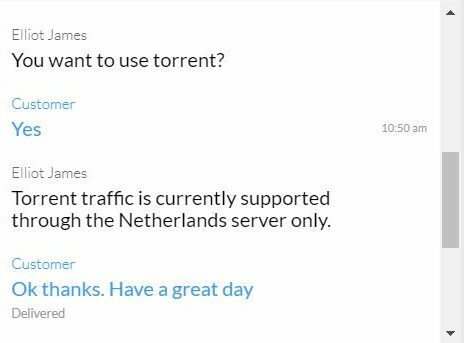 Here’s one such encounter that I had while trying to figure out if there was a better way to use SaferVPN for torrenting (which we will talk about in the “Cons” section). This whole conversation took place in about 90 seconds and is very indicative of my overall customer service experience. Their team isn’t the most knowledgeable support crew that I’ve ever seen, but they got the job done and they did so in a matter of minutes. However, I should point out that at various points throughout this SaferVPN review, it did seem that they were using an automated software to respond to my customer support inquiries. 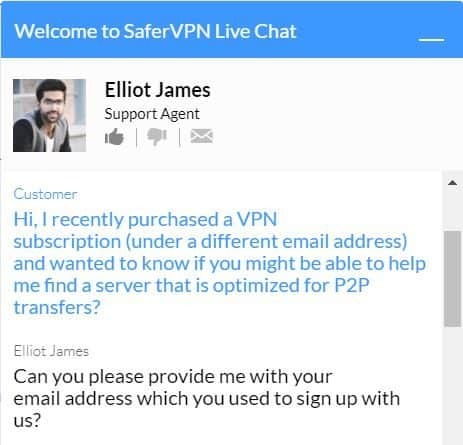 While I cannot verify this theory, I do believe that SaferVPN uses robots to answer some of the more common queries that are submitted through their chat feature and, if you look at the above correspondence, you will understand why. The question that I submitted did not require a client email address for any reason and (considering the fact that they probably receive this question 100 times a day), my support agent should have been able to answer me immediately. Instead, I was asked to provide my email address (less than one second after submitting my question) for no apparent reason making me feel like I was talking to a robot and not an actual agent. This trend repeated itself across several other support questions and while it amounted to little more than a mild annoyance, I did feel that it was worth mentioning. Considering the overall quality of their customer support and the general friendliness of their team, I’ve got to applaud SaferVPN on their customer service… Bots or no bots. As I’ve already mentioned, SaferVPN does not offer a particularly feature dense service. And I’m honestly kind of glad that they don’t. After using their VPN for some time, it’s clear to me that they focused almost all of their resources on optimizing their servers, creating an efficient support team, and offering their services at an affordable price. SaferVPN does a few things great whereas most of their competitors do a lot of things acceptably. 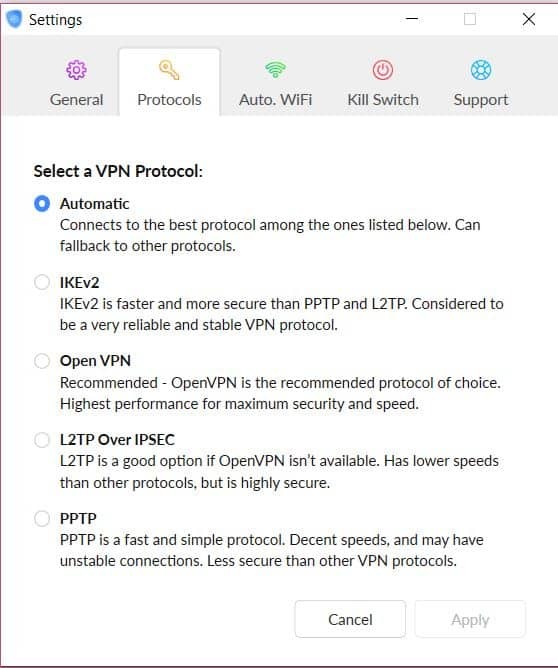 While many users might be disappointed by the apparent lack of bells and whistles, I feel that SaferVPN offers all of the features that truly matter, including a kill switch* and a generous 5 device simultaneous connection limit. Both of these features are welcomed additions to an already stellar service and I am happy to report that (unlike many of their competitors) SaferVPN’s kill switch feature works exactly as advertised. *Kill Switch is a feature that disconnects you instantly when you lose your Internet connections. This avoids your IP being leaked. Headquartered in Tel Aviv, Israel, the mere location of SaferVPN might make it seem like they’ve lost the game before they even set foot on the field. After all, Israel has become an increasingly tumultuous and politically charged region, making many VPN buyers hesitant about trusting their privacy to a company located at the center of the turmoil. I’ll be the first to admit that when I originally learned about their location, I was pretty nervous about using their services too. However, after a little bit of light digging, I found that Israel might actually be one of the best jurisdictions for a VPN due to their privacy laws that severely limit the government’s (legal) ability to track and monitor ordinary citizens. When I tried connecting to Netflix, SaferVPN seemed to work. Obviously, not all of the servers worked, maybe 30%, since Netflix is actively trying to crack down VPN providers and block their IP’s to respect their geo-restrictions. Netflix worked on “US Streaming” and Netherland servers. Although SaferVPN has a lot of great things going for it, their services aren’t perfect and they aren’t for everyone. So before you go smashing that “Buy Now” button, let’s take a quick look at some of the “Cons” of using SaferVPN’s services. Personally, this was my biggest point of contention with SaferVPN’s services. Considering that they have such a vast collection of servers, you would imagine that they would have spent some time optimizing at least a few of those servers for P2P transfers and torrenting. However, SaferVPN only has one server out of their collection of 700 that works for these purposes. (Their Netherlands server if you’re wondering). If you plan to use their services solely for torrenting then forget it. There are much better VPNs available for torrenting (here are 7 best). This particular “con” is far from a deal breaker, but it is an issue that I would like to see the company take more seriously. Something that always bothers me about VPN companies is how misleading their logging policies can be. In fact, if you dig through their privacy policies, it’s not uncommon to find companies that advertise a “Zero Logs” policy while actually logging a metric crap ton of data. Although SaferVPN doesn’t quite fall into that category, they do track a little bit too much data for my liking. As you can see, this isn’t quite the “Zero Logs” policy that we are promised. Although it’s far from ideal, I didn’t find SaferVPN’s logging policy to be particularly worrisome. Would I prefer to use a VPN that doesn’t log any of my information? You bet. Does SaferVPN’s logging policy preclude me from using their services? Not at all. If I ask you to think of the first country where you would need to use a VPN, what comes to mind? Considering their draconian government and oppressive censorship laws, China is one of those countries that you shouldn’t visit without a fully functioning VPN. Unfortunately, according to many third-party sources, SaferVPN’s applications will no longer work while on Chinese soil. And this is a big problem for the company. Expats and travellers all across the world rely on high quality VPN providers (like SaferVPN) to unblock content and keep themselves safe and the fact that their services no longer work in the region is a big blow to their potential customer base. If you aren’t travelling to China anytime soon, then you can ignore this point, buy SaferVPN, and go along your merry way. 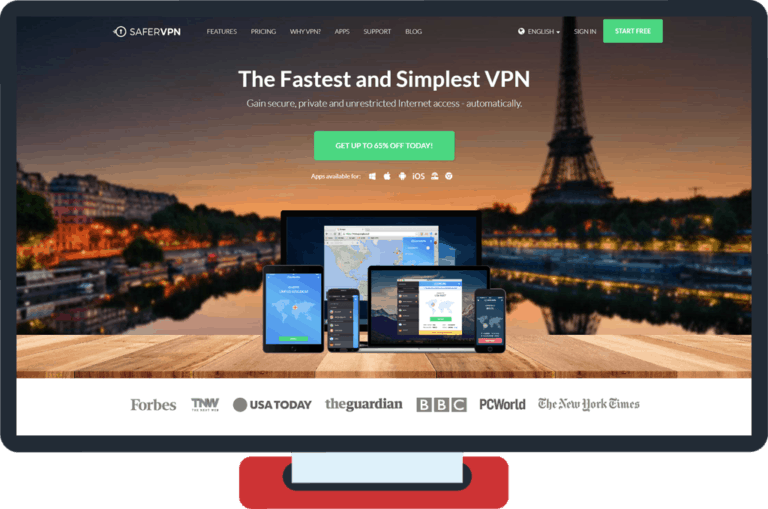 Otherwise, you will need to purchase a more premium service like ExpressVPN (read review here). I was astonished to find that their services are actually marketed at an incredibly budget friendly and affordable price. However, you’ll need to be ready to pay 2 or 3 years upfront. All of their packages offer the same features and services and the only difference between them is how long you actually get to use their service. Some of you might remember that the last time I reviewed SaferVPN they offered a 14-day money back guarantee and a 24 hour free trial. However, they have improved their money back guarantee and extended the return window from 14 to 30 days. SaferVPN also allows their users to pay with a Credit Card, PayPal, Bitcoin (anonymous payment) or Paymentwall meaning that, if privacy is an issue, your entire purchase can be made with complete anonymity. Out of the 70+ VPNs that have been reviewed on this site, SaferVPN currently ranks 9th overall and 5th in speed, but some of the cons are making them un-recommendable. They offer fast (and stable) speeds, a seamless interface, and good customer service all at a decent price. While their services aren’t definitely free of problems and I am eager for the company to improve their Torrenting capacity and logging policy, my experience with SaferVPN was satisfiable. However, you’d be better off using some other VPN providers which we recommend here. For example, NordVPN offers similar features and is also more torrent-friendly. Have you ever used SaferVPN before? If so, what was your experience like? I’m always interested to hear what other enthusiasts have to say about the VPNs that I review! Let me know below. I pretty much agree with this review. SaferVPN isn't expensive and it has a nice interface, but it doesn't work at all in China. I wish I'd known. I'm in China right now and thanking my lucky stars I packed a roaming SIM as a backup! In the beginning I was very happy with SaferVPN. I use it specially to watch BBC iPlayer. Some time ago I have a lot of problems to do it, because several UK Streaming servers are already blocked by BBC. I claimed several times and they did not gave me a solution. On the other hand they have a use-friendly app and browser extensions which work in Windows, Mac and Linux devices. Worked alright but it automatically turns on at login and I can never exit out of the program. It cancels shut down the first time every time I try to shut off my computer. I cancelled my subscription and it's still stuck in the background like a nazgul-not living or dying, but ever present, waiting for its master to return. I wanted a VPN that I could use on both my laptop and Firestick. The laptop installed and worked fine. The support said it could not be used on the Firestick even though they had an Android app. It took many attempts to get a copy of the APK file so that I could sideload it on to my Firestick 2. It all installed OK but failed to run properly. I know I could have installed on a new router if I wanted to buy one, which I did not. I could have set my laptop up as a hot spot, but again I did not want this. So as this did not perform as I wanted it to, and of course there is no 1 month free to test option, I asked for my money back and so far after 48 hours no response. So if you want to just run on a laptop this works fine. I have been trying to install on a Firestick 2 it should be easy but I can not find anyway to download the apk file. Support do not respond apart from the usual "someone will get back to you soon". IPVanish advertise that they work first time out of the box. This VPN is decent it is comparable to some of the other good ones out there I like the fact that it doesn't keep logs and has good speed with directions easy for beginners to understand so it would be a good VPN for beginners to start of with. Easy, fast and very helpful. It's a pretty decent VPN service imo, comparable to IPVanish. Easy to use. Pretty good speed, No logs. Free trial. I like it more because I didn't get too many disconnects or drops in connection like I did with the other VPNs. It's also easier to use compared with others I've tried because it guides you through how to use it thoroughly with directions so it's probably one of the top VPNs for beginners and people just starting out with using a VPN service as well. As a regular VPN user I was excited to try SaferVPN out however was sceptical as I had never heard of them before.I was very surprised with the ease of setup helpful tutorials and simple easy to use interface.The servers are very fast and connect quickly and it contains essential features such as a kill switch.Highly recommend and when activated there is no unwanted notifications to bother you it simply works. I've been using SaferVPN for more than 2 years and I like the app as its light and easy to navigate. I mostly use SaferVPN to stream Netflix USA and BBC iPlayer and other streaming services from UK and their servers provide great speed which makes it a lot better for Streaming services. I absolutely recommend SaferVPN to all who want secure, light and fast VPN. SaferVPN is my first VPN service provider and my only. I am not that tech savvy so I wanted something affordable and easy to use. I work remote as freelancer so safety with client data is my point of interest. As mentioned, so far I don't have a comparison as I didn't use any other services but I am quite satisfied with them and I've had them for 2 years. The speed as you mentioned in the article seems ok and so far nothing leaked from my clients. For the payment system I liked the fact that the payment was done via PayPal because I don't like the back and forth with the bank, it is tedious plus the fact that my bank account is in a different currency. In terms of support whenever I needed clarifications or something was off, they gave me full support, patiently answered and helped me. I see people "angry" at their logging policy and from what I understand by reading it is quite common sense in order to have a better service and also to see if you are a loyal client or not. I would find it nice if they gave me some perks just for being a heavy user of their system which they would know from the duration of the session (please SaferVPN note this 🙂 ) or if they wonder why in one part of the world I use the system more than on another part and cumulating the data they notice some issues and improve. I would hate if they would capture information about the actual information I am working on which is not the case, so I don't mind. Anyway, overall I am quite satisfied with them and not thinking of changing for a while now. Thank You! Such a helpful review! This article is so helpful! I have never considered buying a virtual private network or thought about which one I should buy. It never hit me! SaferVPN does look like the right match for me since I do travel a lot and should consider having protection. It does look user-friendly and their prices are so affordable and seem unbeatable. Yet, I have looked through the cons section. The big one that hit me would be the fact that it could log your data. I would prefer using a VPN that doesn’t track any of my data or information but I guess that shouldn’t affect my decision of purchasing SaferVPN. Thanks to this article, I am convinced that it is time to purchase a VPN so I will test out SaferVPN for about a month to see how I go. Breaking the details of the service down was extremely useful! I have been using SaferVPN for a couple of months now, mainly wanted to have it around for watching the Fifa World Cup, and have been pretty satisfied with the overall service. I have had no trouble watching any of the games online and have even been able to connect to my mother’s US Netflix account. So as far as no restrictions goes, it’s been great in that department. The main reason why I ended up picking SaferVPN was because of the payment methods. I am a huge PayPal user as I hate putting my credit card online, so being able to use PayPal for my subscription was basically the deciding factor. As far as features goes, sure it doesn’t have as many features as other VPNs out there but you honestly don’t really notice it all that much because it has the basics and it does the basics well. So unless you are coming from a more fully-featured VPN or are someone who needs a VPN for a very specific use, you’re not going to notice the difference. I have been using SaferVPN for the past two years for security, flexible streaming and static online mobility. SaferVPN was great when I started and has gotten even better with the addition of relevant new features such as the kill-switch and Netflix unblocking. The price point is also fantastic especially if you sign up for two or three-year plans. Service was ok during my initial one year however as soon as I renewed my subscription stupidly for 2 years last then the problem started with not being able to connect, neverending e-mails going back and forth that I eventually gave up – now the service has totally seized to work on my phone, netbook and iPad – and instead of the company refunding the rest of my unused months as I requested, I am being ignored. Please do not waste your money using this broken down service. There are better services other there which are also cheap. Google search “free vpn”. I bought this on a lifetime offer, looking to use it as a secondary option and not expecting too much (i.e. dead after a few years). Having used PIA & AirVPN (both excellent), I find SaferVPN to be on par with this quality, fast & reliable for all my needs at a fraction of the cost. I run using OpenVPN on linux, the firefox plugin and on android. If you’re serious about anonymity – tunnel vnc to a raspberry pi! The only slight hitches are the ‘some logging’ policy and the android app crashing on occasion (4GB s625 phone). Their support are wonderful. I was led to SaferVPN by their bait and switch 30 free trial offer. When I got there the offer was worded as a 30 day money back guarantee. I clicked chat and Simon said all they have is a free 24 hour trial. He asked to see a screenshot of the offer. I gave it to him and he did not respond. Somehow I got cut off. I got back on chat with him but he did not honor either offer. Their chat feature does not work properly with iPad so it is hard to show screenshot if out complete conversation. Verdict, dishonest company that violates US laws against bait and switch. The irony is the item I clicked on to read was by a law school. 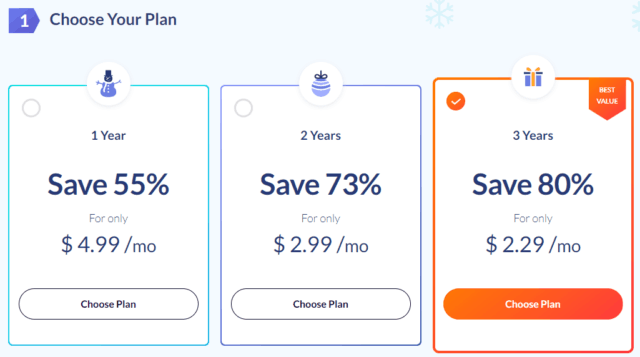 Yes – their flashy landing page might you want to think that this 24 month plan is “cheap”, but it’s not. I’ve used their service for nearly 4 months now and most of the time I just shut it down because it crashes on my Windows 8. I’ve tried getting a refund, but I’ve waited too much on the tickets and their replies are so chaotic. They’re still “verifying” the error. I’ve been using SaferVPN since 2012. It unblocks restrictions by my ISP (smart) which other VPN services I tried couldn’t. Nothing to say much to this as it doesn’t fall on connecting. It’s cheap but not *that* cheap. Only reason for you to use this is for its feature but there’s a lot of services out there that is cheaper and faster. SaferVPN actually not that safe. I’m an ex-customer of SaferVPN. I’m not entirely sure of their logging policy, therefore I made a switch to PIA. PIA is a lot better in every aspect of their software. SaferVPN has a slow, unfriendly UI. Me and my husband weren’t happy with their service. I wouldn’t recommend them, but they are quite cost efficient. I wouldn’t try them though, spend a couple of bucks more a month to get a good and secure service provider.